I'm yet to hear the postmortem from the television and print media, but I'm sure that they will skewer the coach Fabio Capello (and his unintelligible, blinkered post match interview will hardly help matters) but the fault has to lie with his players. Ignore all the upcoming rot about formations, or why Steven Gerrard has to play off Wayne Rooney. England were dreadful because their key players simply didn't perform. It's not because they were shackled by a rigid system or poor tactics. Capello gave the players the same platform to repeat their impressive performances in qualifying for South Africa. And they failed to take that opportunity. But why so? To be honest, I'm at something of a loss to explain the paucity of England's quality, but it looked as if there was a return to the side that struggled for fluency before the arrival of the Italian. To put it into American sporting parlance, England choked. 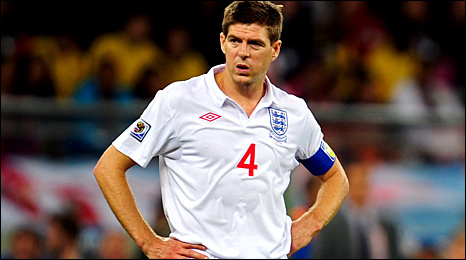 Captain Steven Gerrard was frank in his post match assessment, saying that England lacked cutting edge in the final third of the pitch. But often they failed to get the ball into the areas where they could hurt the Algerians. Their ball retention was simply abysmal. If I was to single out examples here it would leave me with no space to write anything else. Not only was the standard of passing unacceptable but it was the identity of the culprits that made it all the more galling. England's three key attackers, Gerrard, Rooney & Frank Lampard were so profligate, it made it impossible for England to construct any substantial goal threats. While they managed to force tangible goal attempts against the USA, England only worked the Algerian goalkeeper Rais M'Bohli once. Get ready to hear complaints from the fans bemoaning a lack of passion in the next five days. To accuse England of playing poorly because they don't care is wrong and unfair. On the 4th June, I wrote that belief would be key for England. It's clear that since Robert Green's calamitous error in their first game, England's level of self esteem is at rock bottom. When he first took over the England job, Capello said that he was staggered by how players who excelled in the Premier League became so meek and timid when their club badges were replaced by the Three Lions. It looked as if Capello had found the formula to ease the burden of the English media and supporters over the last 18 months. But as the national scrutiny of the World Cup has arrived, the millstone has returned. England are by no means the most technically skilled side in this competition, but Capello must ensure the England players rediscover their mental courage in time for Wednesday's make or break game against Slovenia. And when I say courage, I'm not talking about the tub-thumping, 'Inger-land', throwing yourself into tackles rubbish that went out of fashion with bell-bottoms and the 3 day week. I'm talking about the courage that allows players to produce their optimum when the eyes of the world are watching. I said after the match against the USA that England's hourglass was almost out of sand. Well the hourglass is empty. England are now the cowardly lion in 'The Wizard of Oz', fearful, callow and deferent. They're on the yellow brick road straight into the last-chance saloon. Sick of my analogies. Fine. How about this? If England fail to rediscover their courage on Wednesday afternoon, football won't be coming home. But they will.